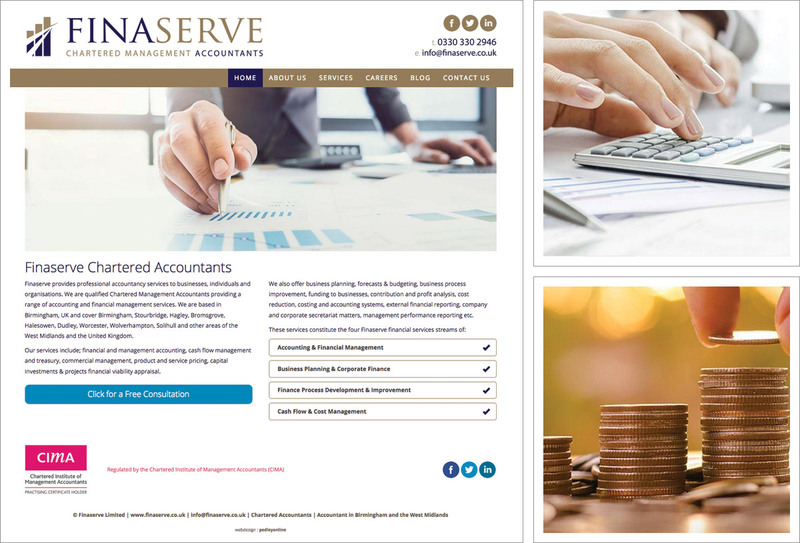 A new responsive / mobile friendly website for Birmingham based Chartered Management Accountants, Finaserve Ltd. Their objectives were to create a user friendly website with a professional image. They also wanted to be able to add news items themselves. We first worked on securing a suitable domain name on their behalf. We created a small number of logo concepts for them to feedback on, taking one forward to a final design for use on the website and other materials. Finaserve provided the on-page text content for the web pages and we used a number of suitable stock images in dynamic changing images holders which provide impact on the home and other key pages. News items in the blog section display a blog roll in chronological order showing a snippet of the full post with a ‘read more’ tag to reveal the full news item. Once the site was complete we provided a short training session to show Finaserve how to add new articles. Finaserve are delighted with their website and it is already receiving positive feedback from their website users.